Has me thinking about spring. Contrary to what the pallor of my complexion may lead you to believe (in 7th grade my bare midsection may or may not have overexposed film in a beach photo), I was born & raised in Southern California. As much as I love having seasons, I had a rude awakening when I went away to college & learned that not everywhere in the country has ripe, fresh produce year-round. So I do the best I can, & especially in the winter, I often end up taking the frozen route. But not with this recipe. I repeat: frozen will not work with this recipe. I’ve tried. You just can’t have perfection like this without fresh, juicy blueberries. 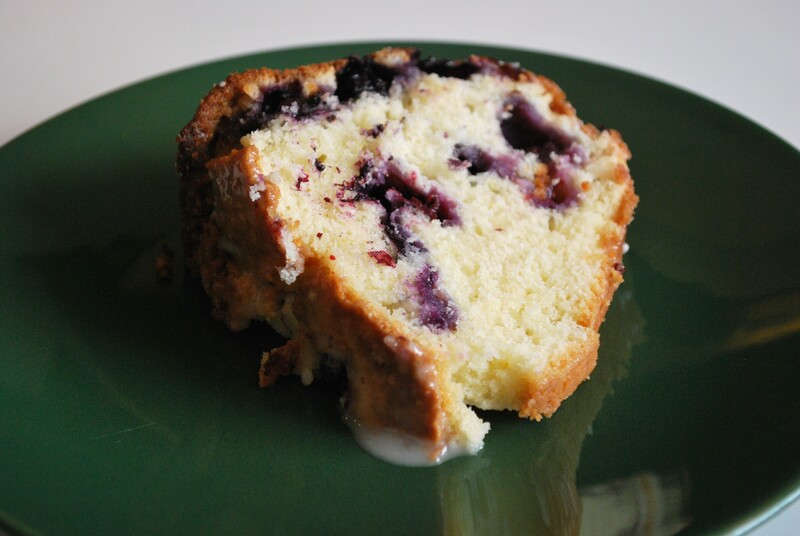 So every year I keep my eye out for the first batch of fresh blueberries that come in, just for this cake. As you can see, it’s totally worth the wait. It comes from a trusted source: my parents’ Ward Cookbook. 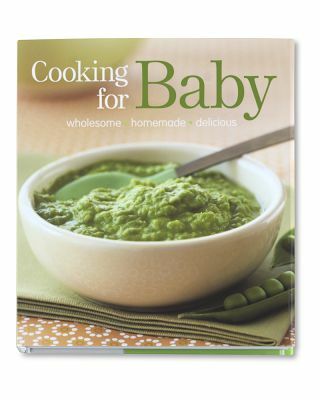 I firmly believe that most Ward Cookbooks offer a better variety of delicious recipes I’ll actually cook (because all these people actually have cooked them with small humans tugging at their pantlegs, rather than having their test kitchen minions do all of the work). Better still, I know the cook who submitted this recipe, & anything coming from him is going to be the most delicious thing you’ve ever tasted. Preheat oven to 350. Butter & flour a 10-inch Bundt or tube pan (I prefer the PAM Baking spray because it’s all 1 step). Combine flour, soda, & salt in a bowl; stir well with whisk. Beat butter in stand mixer until light & fluffy. Gradually add sugar & lemon extract, beating until well blended. Add eggs one at a time, beating well after each addition. Add lemon zest & 2 Tbsp. 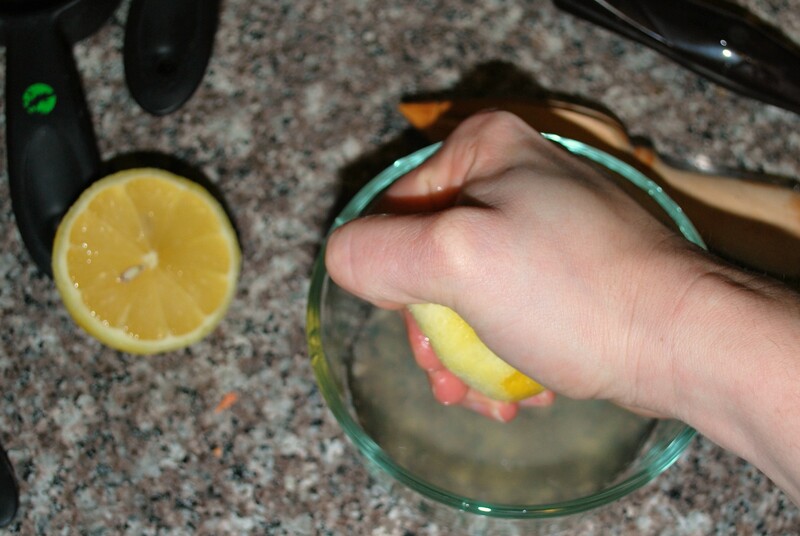 of the lemon juice; beat 30 seconds. With mixer on low, add flour mixture to sugar mixture, alternating with sour cream, beginning & ending with flour mixture. Remove bowl from mixer & fold in blueberries. Pour batter into prepared pan. Bake for 1 hour & 10 minutes or until toothpick inserted in center comes out clean. Cool in pan 10 minutes on a wire rack; remove from pan. Cool completely on wire rack. Combine remaining lemon juice with powdered sugar. Drizzle glaze over cake. Enjoy when glaze is set. 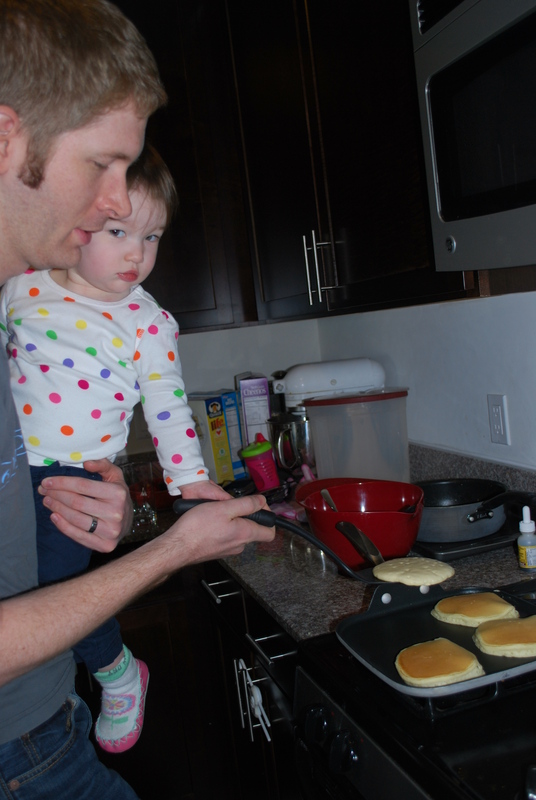 I had The Munchkin help me stir the glaze, so that’s why it’s a little lumpy. 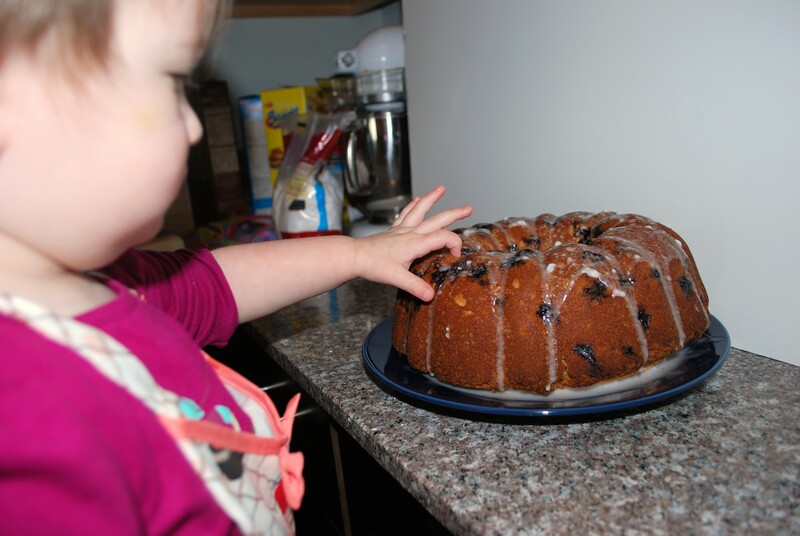 Unfortunately, it seems she preferred poking the blueberries to actually eating them; she’d only eat the lemon part. Which reminds me: you can make this without the blueberries. But that wouldn’t be as fun, would it? 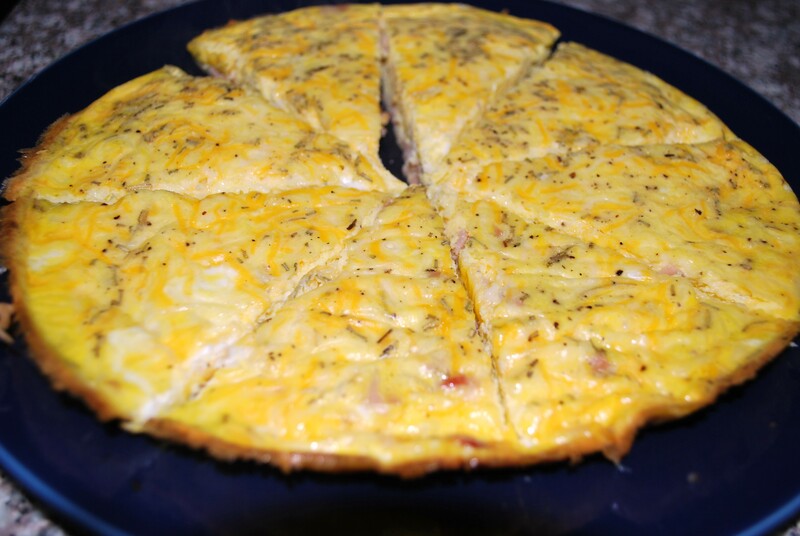 How to make a frittata. I’ve been mystified by the frittata ever since seeing this frittata pan set in a Williams-Sonoma catalog. Something so special it needs its own pan? Granted, Williams-Sonoma seems to think everything requires a special pan, & my specialized egg pan fetish began & ended with my incredible All-Clad omlette pan, but still, this mystical frittata intrigued me. Then my mom gave me the Cooking for Baby cookbook (fabulous cookbook by the way — so much more than baby food in here), & there was a frittata recipe inside! Guess what? It didn’t even require a special pan set! 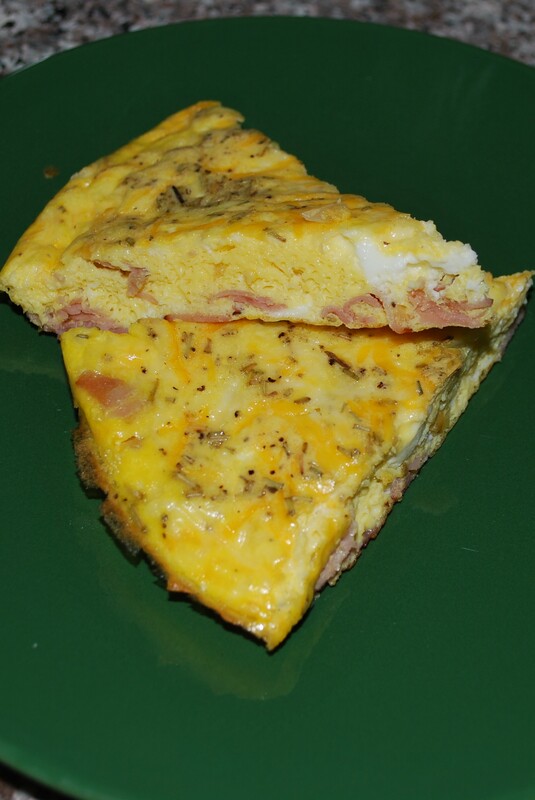 Why make a frittata? Other than the culinary street cred it’ll give you, it’s actually quite easy, & the oven time makes it so that you don’t have to be flipping pancakes & making sure eggs don’t burn at the same time. Look at me looking out for you. Also, it keeps well in the fridge. The Munchkin likes eating it at room temp, so it makes for a protein-packed snack on our city jaunts: just pull out a wedge, nuke it for several seconds so it’s not cold anymore, stick it in a baggie, & pack it in the diaper bag. Just look at that. The herbs & cheese float to the top, & the meat (& veggies, if you’re using them) stay on the bottom. Layers & layers of incredible edible egg goodness. Here’s what you need. The recipe leaves lots of room for improvisation based on what you have on hand & what your kid likes to eat. There are suggestions below. Cooked diced ham & potatoes, grated Gruyere cheese, & minced fresh rosemary (I use chopped deli ham, shredded Colby/Jack, & dried rosemary). Grated or finely diced uncooked veggies of choice (zucchini, red bell pepper, tomatoes), crumbled goat cheese, & fresh basil or thyme. Or use cooked diced veggies. Chopped black Nicoise olives & sun-dried tomatoes, crumbled feta cheese, & fresh dill. 1. Preheat oven to 350. 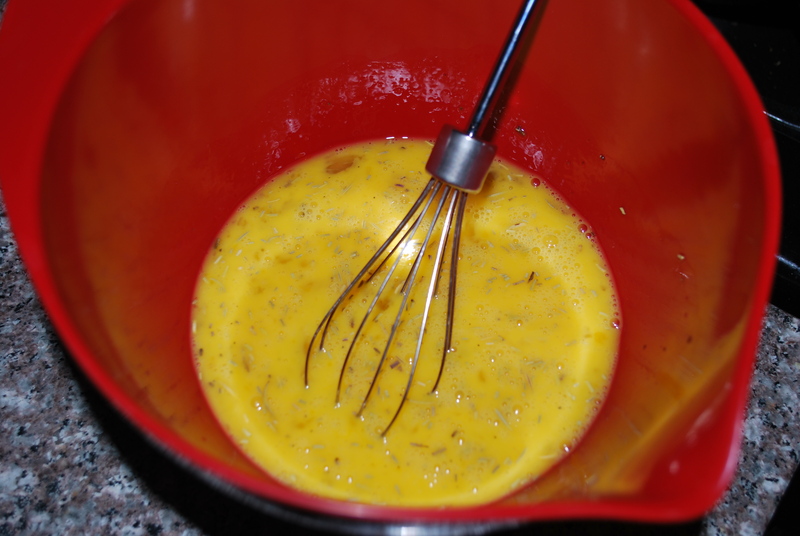 In a medium mixing bowl, whisk together eggs, herb, salt, pepper, & 1 Tbsp. water. 2. In a large ovenpoof frying pan over medium heat, melt butter. 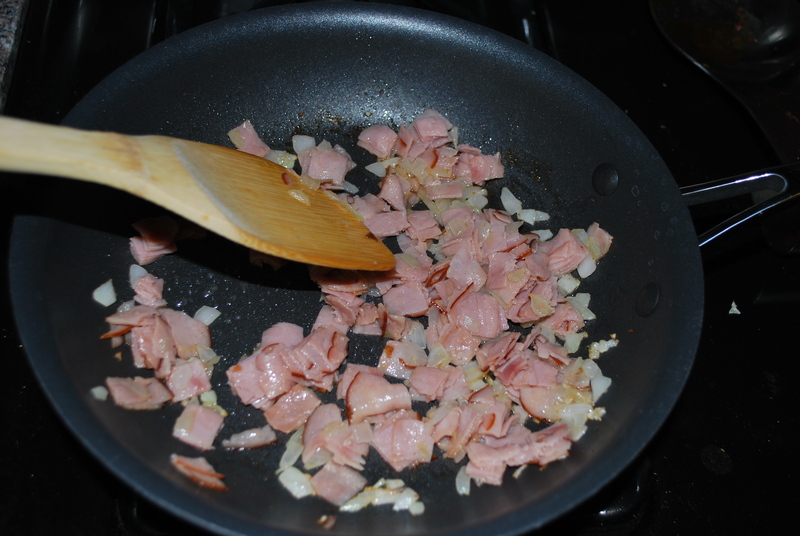 Add onion & saute until soft & translucent, about 3 minutes. Add veggies & meat, if using, & saute 2 minutes to warm through. Shake pan to spread veggies &/or meat evenly in pan. 3. Remove pan from heat & pour in egg mixture. 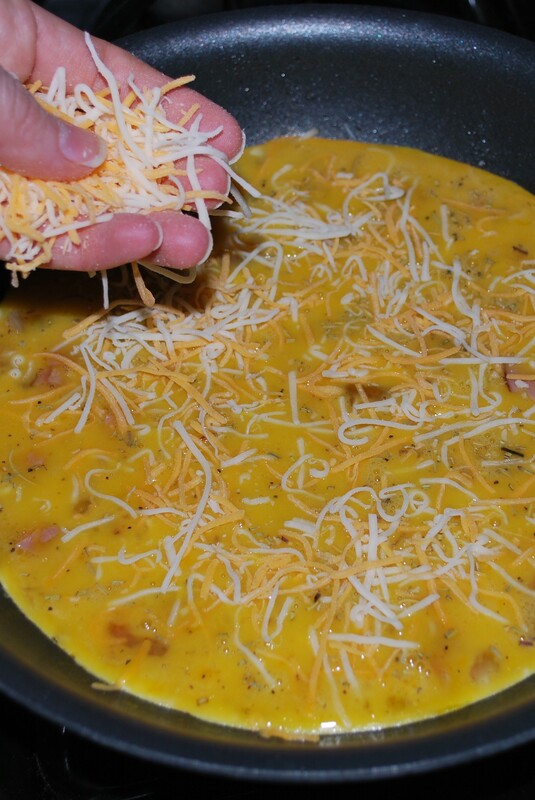 Sprinkle cheese over top. 4. Bake until center is set & cooked, & edges are browned & pulling away from pan sides, 10-15 minutes. Remove from oven & let stand for 5 minutes. 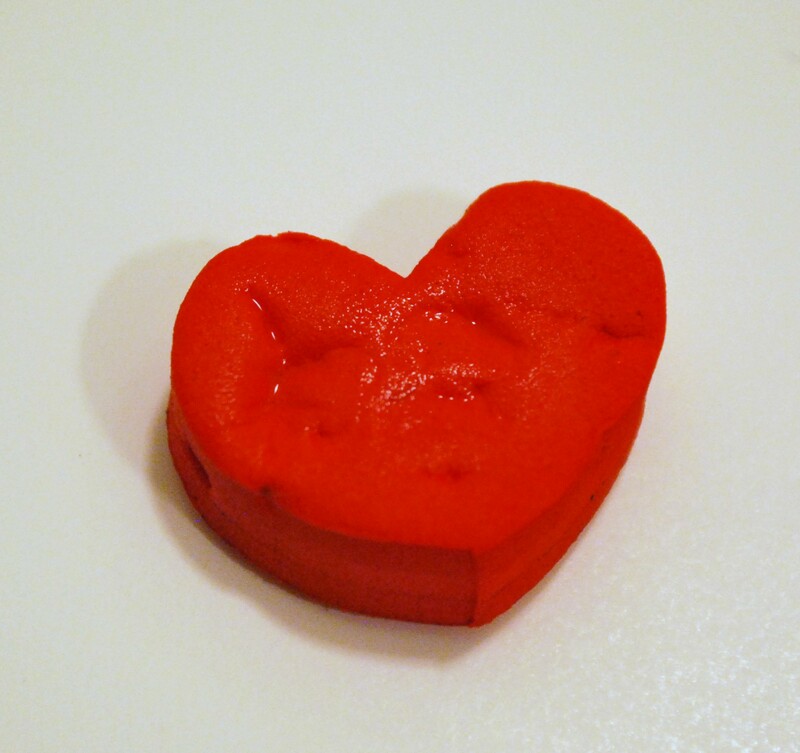 Slide (or if you’re feeling really daring, flip) onto a plate; cut into wedges or squares with a pizza cutter. Snow day… I mean, month. 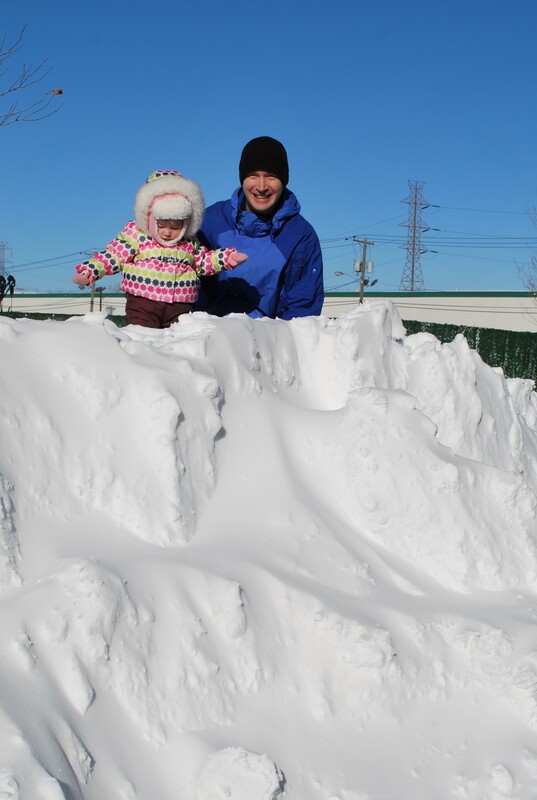 Before we moved here, someone told us that it doesn’t snow much in New York City. First, there was the Boxing Day blizzard, which gave us 2 1/2 feet of snow. Since then we’ve had a few assorted Nor’Easters, including two this week. We haven’t seen the sidewalk on the way to the train station in over a month. I got to push the stroller like a sled through the unshoveled streets of Hoboken on the way to a doctor’s appointment yesterday in that horrible sharp snow that stings your face. 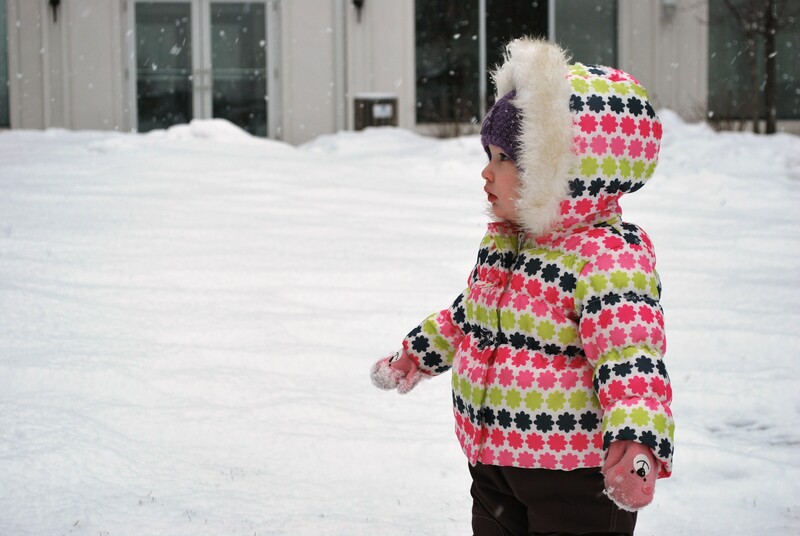 Yesterday the news forecasted 4-7″ of sleet & freezing rain; instead we got a foot & a half of snow overnight. So the city shut down, which means my husband has a snow day! 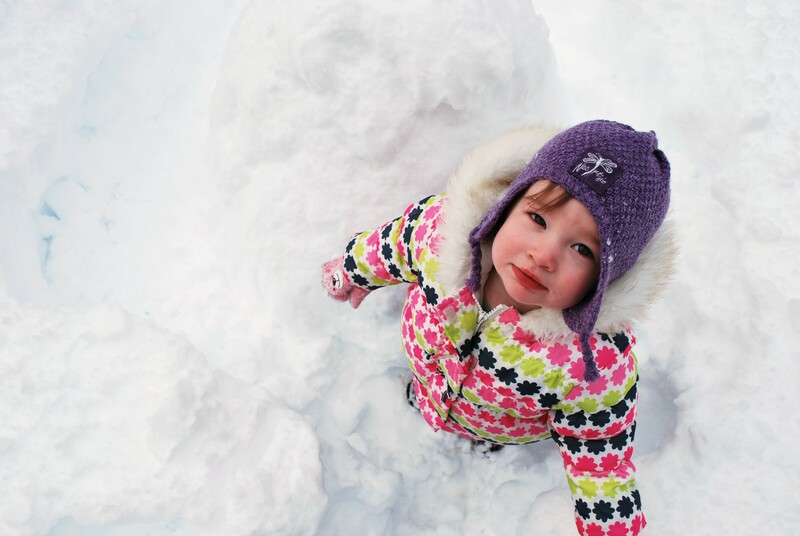 When The Munchkin wakes up from her nap, I think we’ll head out to play in the snow yet again. I’m open to new ideas. 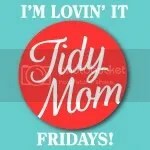 How do you keep your kids busy & yourself sane when you have to stay indoors? One of The Munchkin’s most-requested shows to watch is “Ratatouille.” I love watching her sit, wide-eyed, during the kitchen scenes. When I cook, unless I’m distracting her with a show (see above), she’s always tugging at my pantlegs wanting to see what I’m doing. Most of the time what I’m making involves a hot stove &/or icky, potentially bacteria-laden raw ingredients, but I try to involve her in my cooking when I can. She has the apron to prove it. 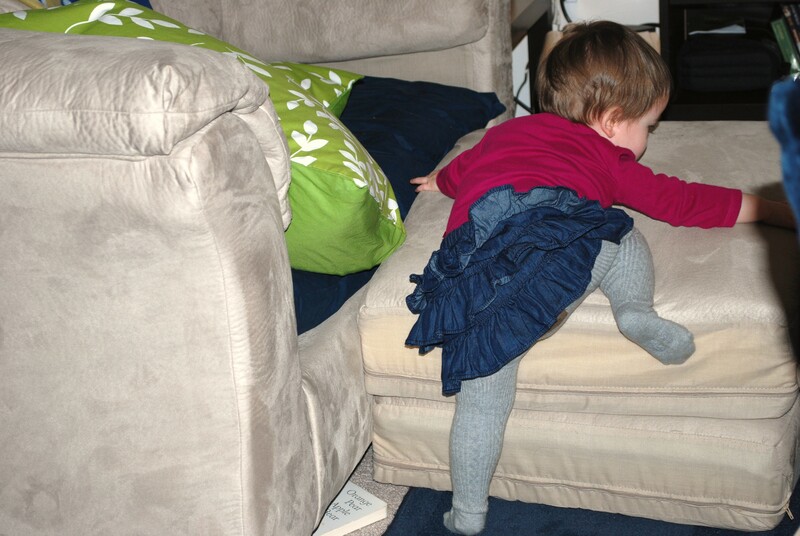 At 19 months, though, it’s hard to find age-appropriate things for her to do! Lunchtime is when I usually have her help. 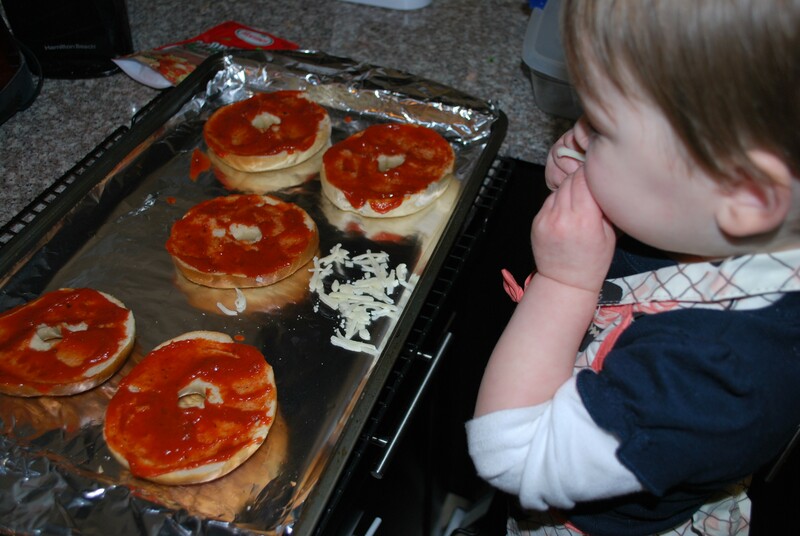 Her favorite thing to help me make is bagel pizzas. 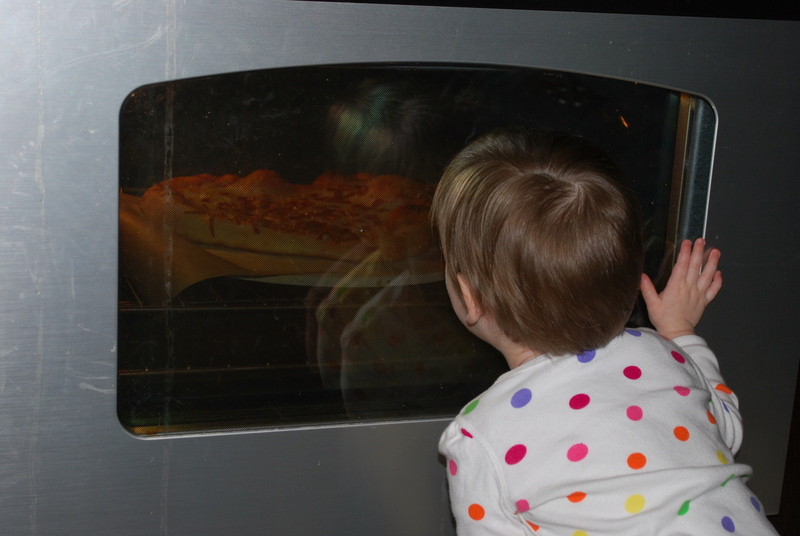 She knows the order in which to add ingredients, & I sprinkle a little cheese or some pepperoni on the cookie sheet for her to sprinkle onto her pizza. She was pretty good at that until she realized that those things tasted good BEFORE they were cooked, too. 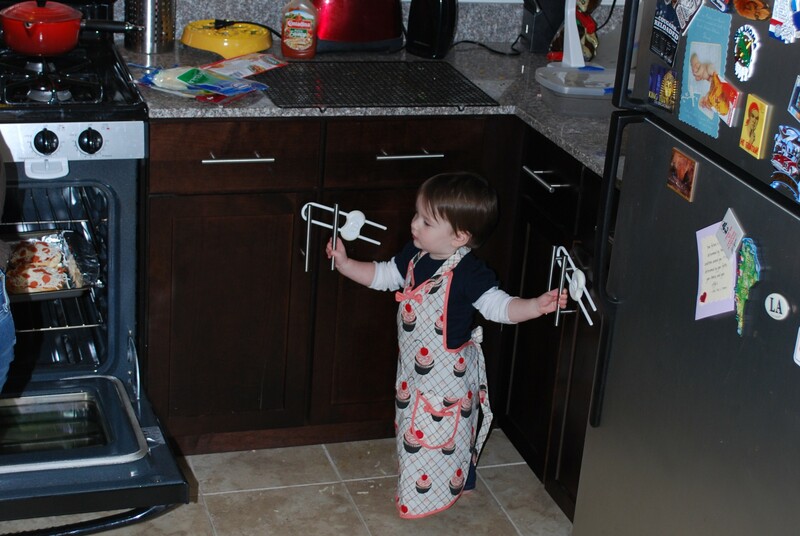 Kids in the Kitchen has a great list of age-appropriate tasks for your Kitchen Helpers of all ages. I guess those age recommendations are there for a reason. Today The Munchkin & I were at A.C. Moore to pick up a few things. 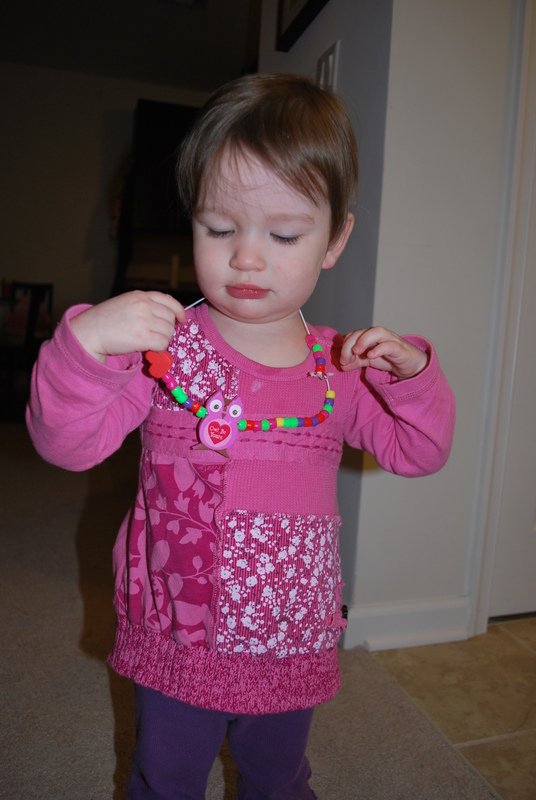 While perusing the seasonal section, I found a $1 Valentine’s necklace kit. The Munchkin loves bracelets, necklaces, & playing dress-up with our winter scarves, so I thought this would be the perfect little craft. The packaging said “Choking hazard. 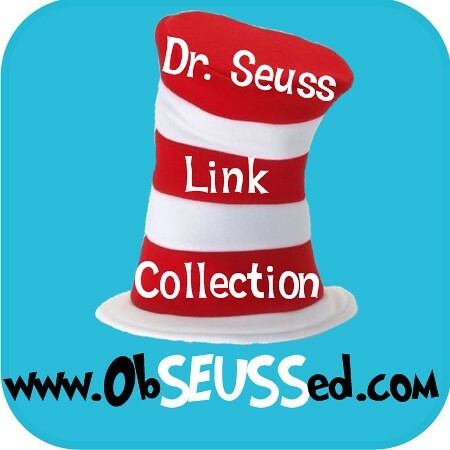 Ages 3 & up,” but so does everything, so I got it anyway. 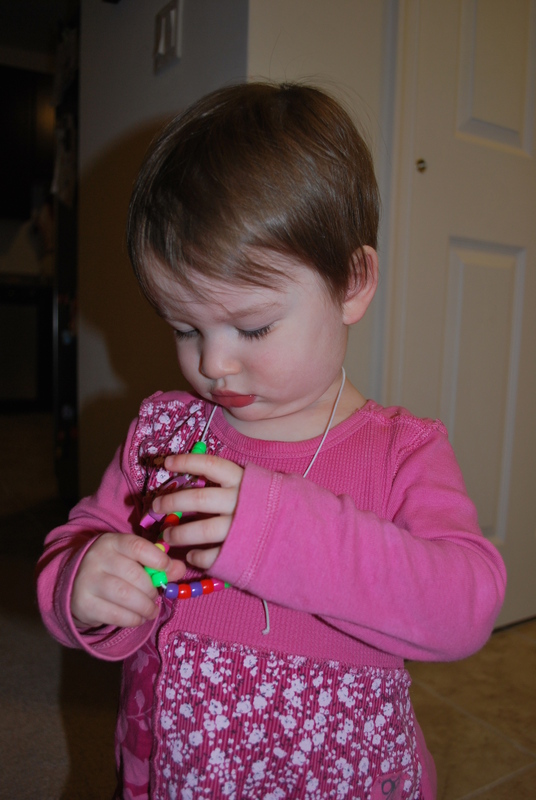 She was so excited about her necklace that we got it out as soon as we got home to put it together. 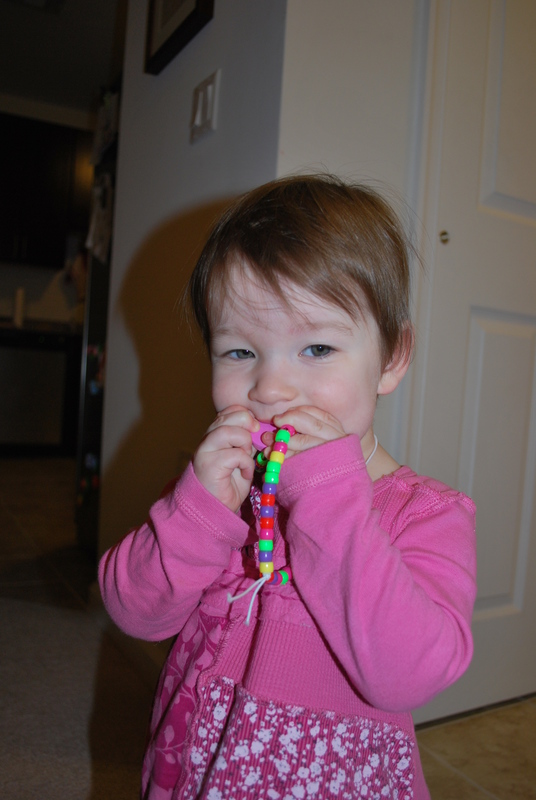 No sooner had I emptied the package than at least three beads ended up in The Munchkin’s mouth. So the next few minutes consisted of her popping bead after bead into her mouth, me having her spit them out, & then stringing each soggy bead onto the elastic before it really did become a choking hazard. Some of them didn’t make it. Lesson learned. I’ll be paying closer attention to those age recommendations from now on. Better Bolognese on a Budget. 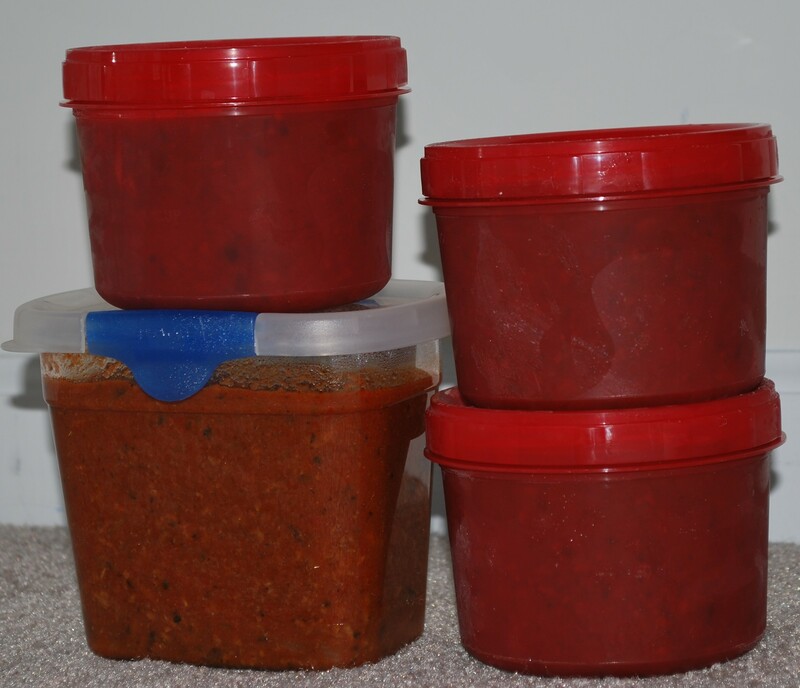 Not long before The Munchkin was born, I found this recipe for bolognese sauce on The Pioneer Woman’s cooking blog. I had been looking for one for a while, & this met all of my criteria: it had to be delicious (duh), & it had to use just ground beef. No veal, no sausage — just ground beef. Why? Because I’m on a budget. As an added bonus, all of the other ingredients are standard pantry items, like dried herbs instead of fresh, & canned tomatoes. So much less work, so much less money. So, my 8-month-pregnant, back-laboring self set out to make it. I’ve made it every month since. Why do I love it so? Aside from its budget- & palate-friendliness, it’s very convenient. It takes awhile to cook up the first time, so I reserve a Sunday afternoon every month & a half or so for my husband to entertain The Munchkin while I work. After our delicious spaghetti dinner, I freeze the leftovers in smaller portions for times when I don’t have the time or energy to cook. Just pop the container in the microwave to defrost, dump the sauce into a pan to heat, & cook up some pasta! Right there, I have 5 dinners made in one afternoon! Additionally, there are so many “hidden” healthy ingredients, like grated carrots, that it’s ideal for picky eaters — so much heartier & healthier than most jarred pasta sauces. Without further ado, here’s my version of Pastor Ryan’s Bolognese Sauce from The Pioneer Woman Cooks. *The amount of olive oil you use will depend on the leanness of your ground beef (see next asterisk). More oil for leaner beef. 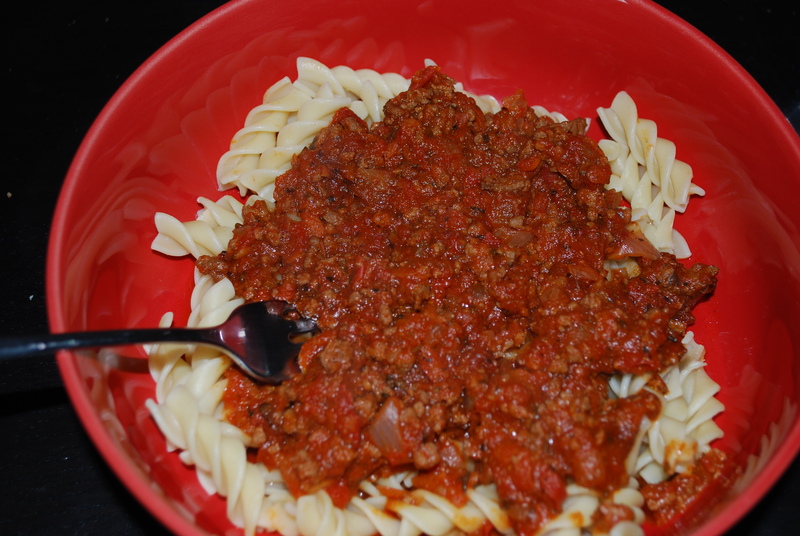 **The ground beef does not get drained in this recipe, so leaner is definitely better. Otherwise it gets REALLY greasy. I usually use 90/10. Heat oil in large Dutch oven over medium heat. Add carrots & onions & saute a few minutes. Make a well in the center of the mixture, then add ground beef. Cook until browned, gradually incorporating into carrot mixture. Add spices. When ingredients are combined, make another well & add tomato paste. Let it heat while you add the garlic; stir to combine. Make another well; add stock & vinegar. Stir. Add worcestershire. Stir. Add milk or sugar. Stir. Let simmer 30 minutes to 2 hours. Serve over a hearty, thick pasta that holds onto this hearty, thick sauce. We prefer rotini or penne. Top with parmesan, if desired. Freeze remainder into smaller portions. I feel that this sauce is always better the second time around! You can find these & several other patterns & instructions at a website called Mormonchic.com. All you need are a printer to print off the pages, some file folders, a laminator & laminating pages (apparently laminators are quite inexpensive, but you can also go to Kinko’s & do it at their self-serve laminator), scissors, 6″x9″ manila envelopes, double-stick tape, & Velcro tape (to be economical we just bought the strips & cut them, but that really gummed up my scissors, so if you can, you may want to get the adhesive Velcro dots instead). First, print off both pages & cut out each game piece. Laminate both pages–the background & the game pieces–& tape the background page to the right inside of the file folder. Tape it well, not just around the edges (I learned that the hard way–pulling off the Velcro can require some force!). Then cut out the laminated game pieces. Tape the manila envelope to the left inside of the file folder. Stick the “scratchy” side of the Velcro pieces in the desired spots on the background page & the “fuzzy” side on the back of each game piece. There will be more game pieces than spots on the board. The rest of the pieces go in the envelope. 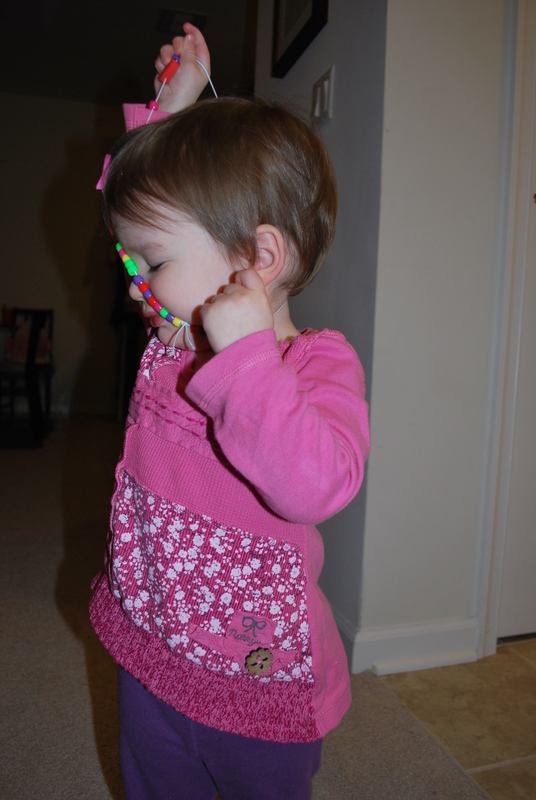 What do you do to keep your kids quiet & occupied during church or in the car or doctor’s office?